Dine Mile High is bringing you the travel experience without the hassle and the price that comes with a case of wanderlust. Their dinners allow you to enjoy the best parts of flying during the golden age of air travel, here on land. The final rounds of Mile High dinners are happening this weekend at 168 Bowery, where they’ve been serving up the travel experience since September 24th. Earlier this year they popped up several times in London, taking people to destinations like Beirut and Copenhagen! 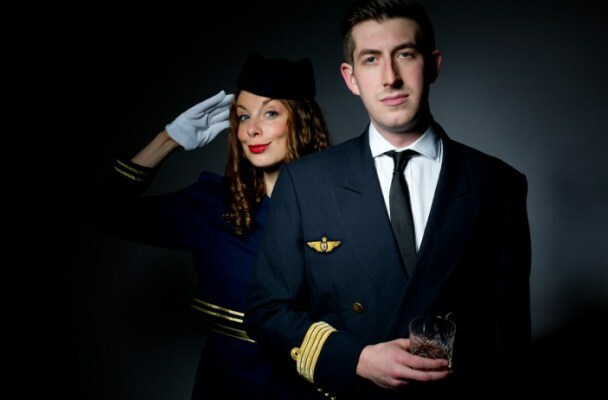 The dinner is equipped with a ‘cabin crew’ , dressed in Pan-Am style uniforms, making sure you have a drink in hand while you ‘check-in.’ The ‘flight’s’ dinner is created by Chef Oliver Templeton, inspired by the food of your destination for the night, which this time around is London!